(San Diego, CA) – More than two-thirds of California voters feel the state is not prepared to address the health and social service needs of its fast-growing senior population, and that sentiment could sway votes in the race for governor, according to a new poll commissioned by two California-based senior-focused nonprofit organizations. California is heading for a crisis in caring for its older population if the state and next governor do not act now to create effective and cost-efficient policies. In proportions rarely seen in statewide opinion research, more than 80 percent of California voters say that when it comes time to vote, they are more likely to support a gubernatorial candidate who has a plan for aging Baby Boomers and seniors that effectively addresses their growing demand for healthcare, dental and social services. According to the Public Policy Institute of California (PPIC), the state’s 65-and-older population is projected to grow nearly 90 percent, or by four million more people, by 2030, which spans the next three gubernatorial terms. This poll comes as West Health and The SCAN Foundation launch “We Stand With Seniors…Will You?” a public awareness and education campaign on the specific challenges seniors and their families face in accessing high-quality, affordable healthcare, dental care and supportive services and the cost to the state if these challenges are not addressed. In the months leading up to the election, the campaign will convene seniors, advocates and policy makers for educational forums throughout the state and conduct periodic surveys on how well the gubernatorial candidates are addressing the issues. • 67 percent of voters feel that California is NOT prepared to care for its aging population. • 87 percent of voters agree that providing dental care for seniors is as important as access to healthcare. • 83 percent of voters would be more likely to support a gubernatorial candidate who has a vision and a long-term investment plan to address the increasing demand for senior services for California’s aging population. • 82 percent of voters are more likely to support a gubernatorial candidate committed to making high-quality healthcare for seniors more accessible and affordable. • 80 percent of voters support the state investing in caregiver programs that assist those who care for senior family members. • 79 percent of voters support the state making in-home healthcare service investments that allow seniors to age successfully in place, including medication delivery, telehealth and house calls. The poll also showed voters want state legislators to support seniors. Eighty-two percent are more likely to support legislative action that improves seniors’ access to dental care, a benefit Medicare does not provide. Voters also want to see improvements in independent living services, mental and behavioral health and other senior services. From Friday, January 12, 2018 through Sunday, January 15, 2018, J. Wallin Opinion Research conducted a telephone survey of voters throughout California. One thousand voters were interviewed using live, professional interviewers, speaking both English and Spanish languages and calling both mobile and landlines. The sample is stratified (the demographic composition of our results matches the demographic composition of the state’s voting population) and has a margin of error of +/-3.1 percent (95 percent confidence interval). West Health and The SCAN Foundation’s “We Stand With Seniors …Will You?” public awareness and education campaign focuses on the specific challenges seniors and their families face in accessing high-quality, affordable healthcare, dental care and supportive services and the cost to the state if these challenges are not addressed. 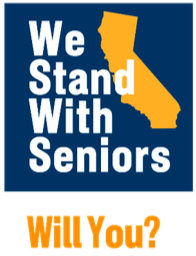 Visit www.WeStandWithSeniors.org for more information. Keep up with #StandWithSeniors on social media via Facebook @WeStandWithSeniors and Twitter @WeStandWSeniors. The SCAN Foundation is an independent public charity dedicated to creating a society where older adults can access health and supportive services of their choosing to meet their needs. Our mission is to advance a coordinated and easily navigated system of high-quality services for older adults that preserve dignity and independence. For more information, visit www.TheSCANFoundation.org and follow @TheSCANFndtn.